Better late than never, right? I have been wanting to post my favorites from the One Room Challenge Guest Participants for a few weeks now but between the end of school craziness and my big college reunion I have not had a second until now. The guest participants are those (like myself this time around) who join in the One Room Challenge excitement but are not a part of the 20 invited guest bloggers. Can you imagine that there were 243 participants (myself included)!!! That is a lot of people and a lot of talent to be discovered. I went through them and am highlighting my favorites. There are so many ideas, inspiration and takeaways from them. Please explore them! First off, we have this beautiful teen girl bathroom transformation (above) by Vanessa Francis. I love how easy and chic it feels and her tile selections work so well together. Below is another bathroom that has a very different vibe but is fun and punchy. Designed by Design Confetti this one shows us how a little can go a long way. The contrast of the wallpaper pattern and the fabric of the shade is perfection. This modern and clean living room space by the Posh Home is comfortable and understated. I really love the wood paneling on the walls. This adorable nursery by Meghan Bachmann Interiors is precious and perfect for a room to grow in. I can see this easily transforming into a big girl room later on. That wallpaper! Also, the art is quirky and fun. This bold and maximalist powder by Insieme House packs a lot of energy. It is chic, elegant with a hint of tribal. Astrid made the wall deisgn herself. 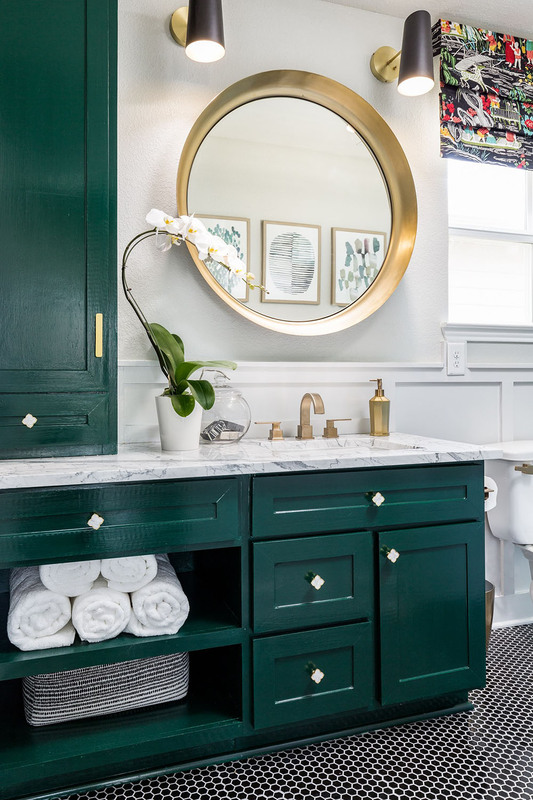 I adore the green hue in this bathroom and the pretty pulls! Designed by the Naked Decorator this one also packs a punch. That floor! I want this this patio space by At Home with Ashley to be cloned in my backyard asap! I just love the palm beach style. Just in time for summer entertaining. This elegant mud room by Room for Tuesday is a special one as it is dedicated to her pups with built in crates and all. It is such a chic and thoughtfully designed space. This wild kitchen/dining makeover by Jest Cafe is everything! It is vibrant and cozy with a major side of happiness packed in. That mural and the red cabinets are my favorite part. Another bold space is this jewel toned living room by Jeweled Interiors. Love the sofa shape and the jewel toned color scheme. That peony arrangement took my breath away as well. Here is another bathroom that is more classic in style but equally as beautiful. The clean and crisp bathroom transformation by Lemons to Lovelys is big in style. I just love the contrast of the gray cabinet with the salmon colored rug. This shared girls room by A House in the Woods is fabulous. The wallpaper is one of my favorite things and guess where it´s from? Target!! I had no idea they had wallpaper now. I checked and their options are actually really great! 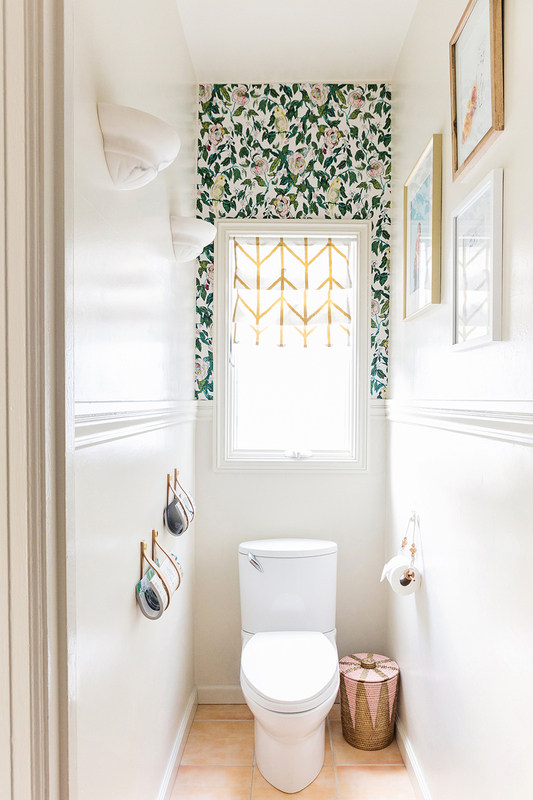 This bathroom by Southern Mesa features a fabulous banana leaf wallpaper that creates a perfect tropical vibe paired with handpainted floor tiles in black and white for contrast. So good! This kitchen renovation by Haneen's Haven is definitely a favorite. I love a kitchen that is elegant and chic and this is both and more. You need to see the before photos, the transformation is major! My favorite part was is the lighting choices and the waterfall island. This happy and bright study by Arsenic Lace is pure fun. Oh the things we can do with some fresh paint and a creative mindset! This modern attic space from Most Lovely Things feels cozy because of the grey wood accent wall (they used peel and stick reclaimed wood planks!). It helps balance the wall slants and creates a perfect focal point. This bold and colorful teen girl's bedroom by Dimples and Tangles has wonderful color combinations. Again, here you can see the power of paint. This playroom by Park and Division with the fun reading nook is so creative. This is a perfect space for kids to dream. The wallpaper in this dining-in kitchen by Love and Renovations has the prettiest colors and pattern. It totally makes the space, especially with the perfectly chosen jewel toned pillows in the banquette. I have a soft spot for libraries and this transformation by Deeply Southern Home is sensational. Leslie chose the best grey hue for the bookcase and she built her own rolling ladder for it! I just love the classic old world feel of this great space. This a pretty dining room transformation by Porch Daydreamer. It is feminine and romantic and the new designs makes the room feel lighter and more welcoming. I loved this rental friendly sewing studio re-design by Markova Design. The highlight for me was the tranformation of the cabinet and the floral wall decals which make such a statement. And last but not least below is a perfectly welcoming guest bedroom by Eleven Houses. This room is a great example of how changing a few things can make such a difference. She changed the wall, doors and bed colors and changed in the art toc reate a fresh and lighter space. I know there are so many ideas and room isnpiration here so take your time touring each individual space. I´m sure you will learn about new DIYs, new sources for items and you´ll find new design oriented blogs to follow. To see all the One Room Challenge Guest Participants visit here.